Hello- only four more minutes and it won't be Thursday anymore!!! After our math tasks were finished and our creative juices were spent on writing, we had to have the best way EVER to display them both! What better way to do that than a craftivity from A Cupcake for the Teacher???!?! "A bandit with a gilley suit with a mask stole his gold and took it to his turf of bandits." 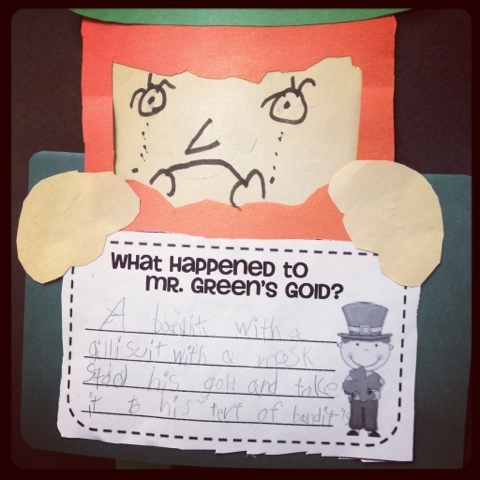 (Always be on the lookout for vigilante leprechauns). 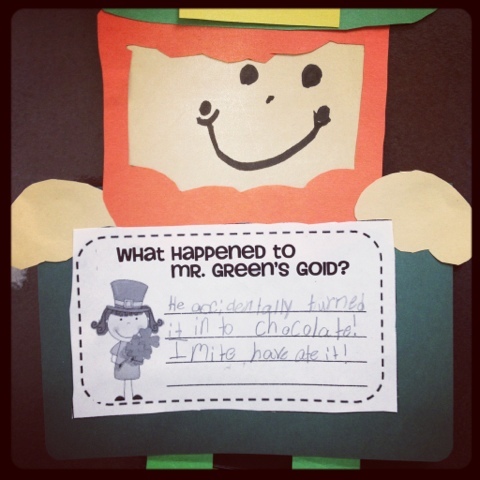 "He accidentally turned it into chocolate and I might have ate it!" This sweetie is the most expressive writer I have ever had. Her tone can be very subtle when she talks to you, but her sense of humor always comes out in her writing! Love her! "Somebody must have took it"
They did an fantastic job. There were lots of possible explanations- but I think we should definitely get a warrant for the bandits' turf- there's plenty of probable cause there!!!! 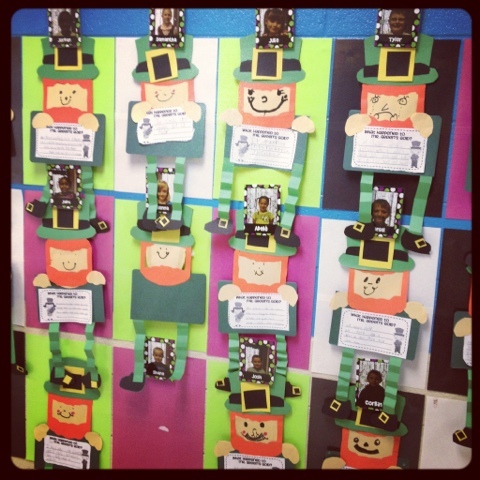 I get my student teacher the day after St Patricks day, I dont know how riled up I want to them the day before. The day after MY BIRTHDAY!!!!! Wondering how old I am? Trying to figure out how old this cutie squirrelish figure is? Yep- I'll wait while you pick up your jaw. 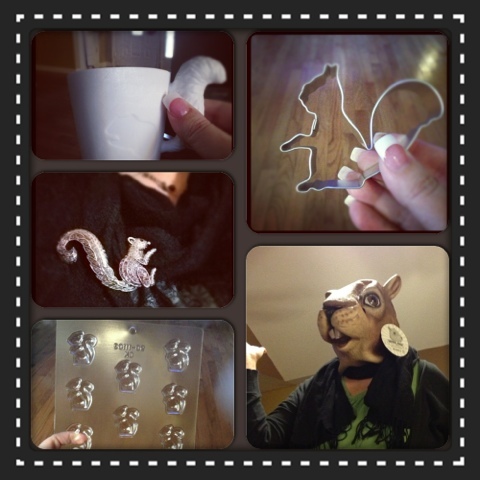 My family made sure it was a day filled with lots of fun for this old Squirrel- check out what came in the mail from my Mother in law! Later this week, I'll continue celebrating by sharing a virtual coffee date with Heidi from MY Not So Elementary Life!!! Congratulations on winning THE WORLD'S SMALLEST COFFEE CUP!!! BOLO the lookout in your mailbox! Hope everyone has a great weekend!!! They turned out so cute!!! Up next: Potatoes!!!! 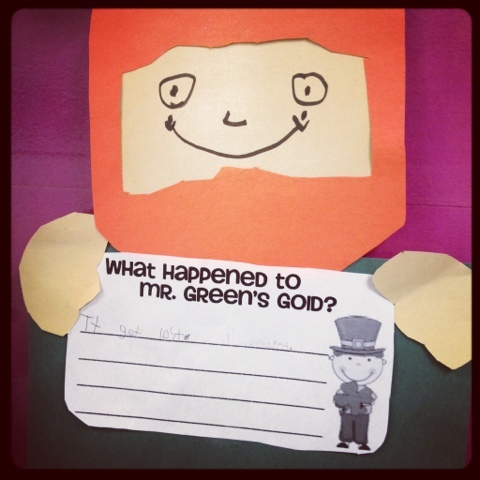 Some of your kiddos have quite the imagination-can't imagine where they would get it from! Your leps are too cute. Ummm does that mean your bday falls on the 9th? It's also my boys and we are gearing up for the big 11. Not quite as spesh as 40 but it's still a great day. I will be partaking next year in the 40 festivities and Tammy the year after that (she's just a pup). Hope your birthday weekend is smashing!!! I turned 40 this year too!! It was quite a deal! 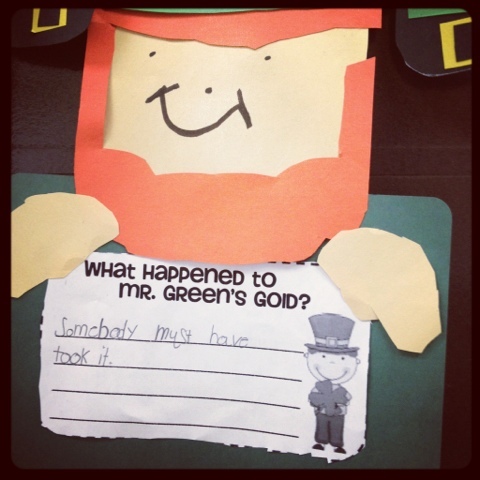 :) The leprechaun writing cracked me up! Love the one where she might have ate it! Have a great birthday weekend! Hi! Found you on the Wallflowers on FB! Love the name of your blog! I am now a follower! 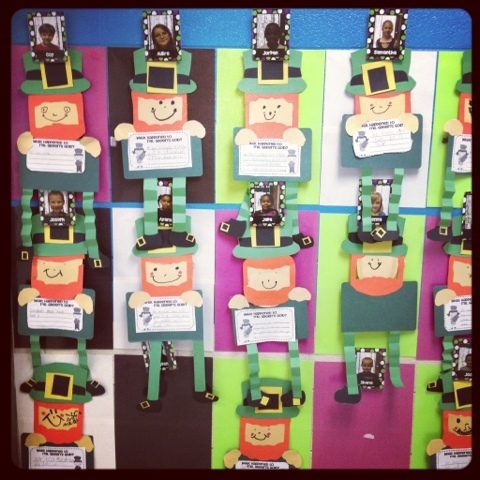 Love the leprechauns! Happy Easter and Super Egg-Cited!! Smelly Freebie and A Sale! 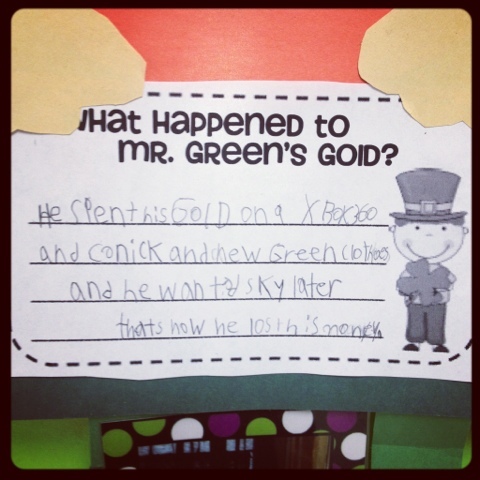 Who Has Mr. Green's Gold???? 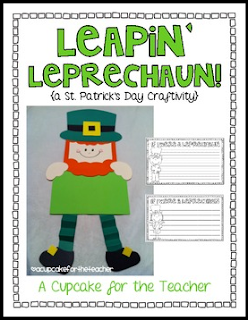 Giveaway and a "Teacher Crush"